I love these cards!!! You can't find stuff like this anymore. 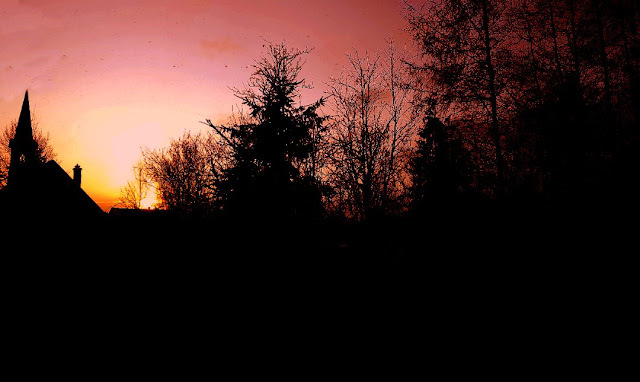 This morning's sunrise. I was up at 5am today. I get so excited on these special days that I couldn't sleep much later! (I'm like a kid on Christmas morning) I wanted to plan the surprises and the dinner and get my day going early. Sigh...doggie updates...Pavlov is out of his cone as of this morning. We had to keep it on longer than expected because he found a way to push the cone onto the bed to reach his toe. So he was licking in secret. 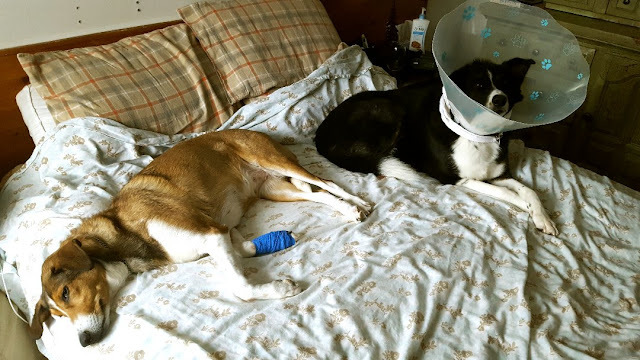 He was banned from the bed after that, but he's on the mend! Stella...her poor paws got all cut up the morning after we had the ice storm. That ice is damn sharp for sensitive paws! She's better this morning too. I hope everyone has a love-filled day and is feeling very grateful for the people and critters in their lives today. :) I am! I'll leave you with a few of the love-themed drawings I did this week! 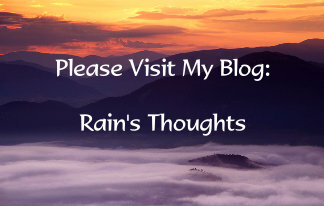 Oh Rain, what a fun post...filled with the old and the new. 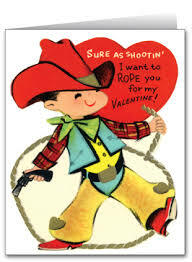 I loved those old Valentines we got in school. It was a favorite as you made a decorated shoe box to take to school for your Valentines. Not any more...just text, text, text..not to romantic. I love your new drawings...they are fabulous and show love from every angle. Your bread looks wonderful, and sorry your doggies have they hurts. 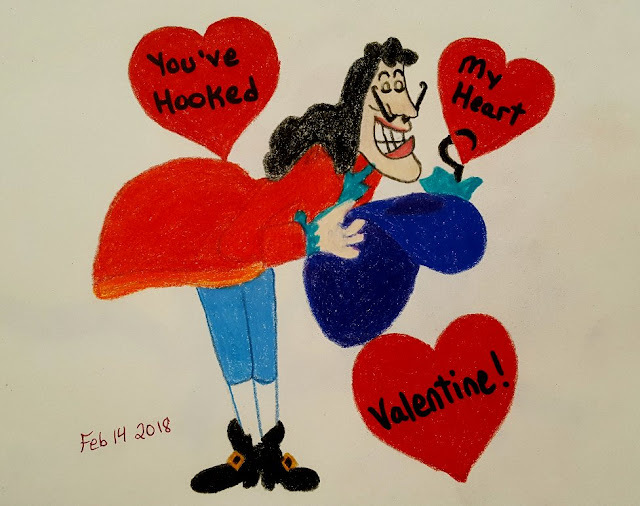 you have been a busy woman and its wonderful to see such love,,enjoy your day with your sweet heart, I really do think they did Valentine cards much better back in the day lol,,the card you made your sweetie is perfect! Ah, I must have lost that zip to the special day. Hubby went to work ill, and one daughter is congested. There will be no special gifts, no cards, and dinner will be a healing chicken noodle soup. I'm actually spending it alone until everyone is off work. I remember the kids getting so excited about when they were little though. Definitely a mushy love Valentine theme in your sketches...I especially like your flowing love watercolour piece. 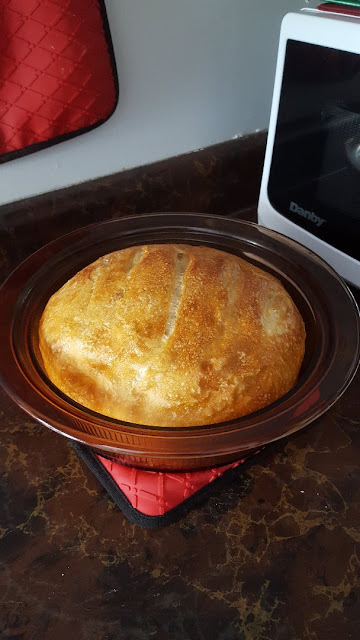 Love the smell of bread baking...so comforting. I feel so sorry for the pooches and their ailments. Glad to hear they are both doing better now. We have a Jack Russell Shihtzu Mix who has sensitive skin and he occasionally has a reaction to something...possibly grass seed....and he can be biting and scratching for weeks. He can get himself in quite a mess and has to wear a cone during those times. He just got over a bout actually. I always feel so sad for him. I love how you really "get into" holidays and such!!! Never lose this, my Dear. It will keep you young. Your art work is so cool. Yes, I remember those cute-s-y little Valentines! Do they still have them? Must look that up. Seems there would still be a market for them, at least among the youngest children. I hope so. If not, another sweet thing, gone from the world. Sad. I can't eat much chocolate. I do not care for roses. But the yummy cream eggs! Yessss! Funny thing is... They come out for Easter. But will be gone, by Easter time. We have learned to get 'em when they appear. Lots going on in your post! Love it! I like the match card best, very cute. Supper sounds like it will be amazing! Happy love day! Sounds like you will have a yummy dinner. Lovely Valentine post today Rain, complete with many 'mushy' pieces for SP! Love your fridge deco and that bread looks so good! Wow! 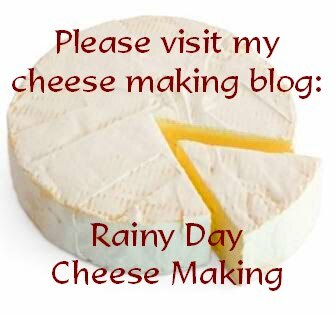 So much LOVEly goodness on your blog today - such fun to see it all! 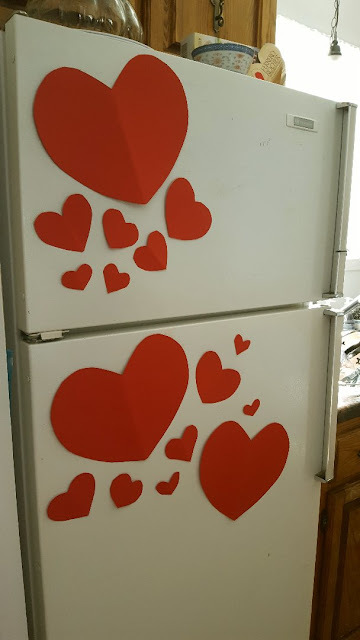 Your valentines are absolutely adorable (and I love the hearts on the fridge). I'm glad your pups are on the mend! Happy Valentines Day, you two lovebirds! Enjoy that fondue, too. I see the heart in your painting - literally. It's beautiful. And those little Valentines are bringing back memories. I have a friend who scours estate sales for things like that. 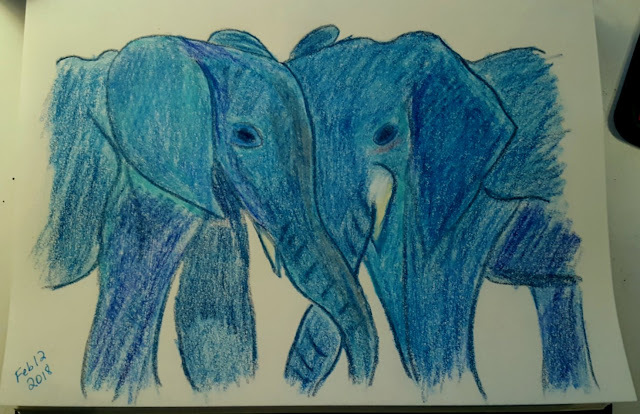 Love those drawings - blue elephants and birds - quite eclectic and quite beautiful. Thank you, Dear One, for your sweet comment today. I love peas dear Rain! 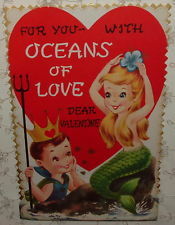 I loved the "ocean of love card from your scool time how amazing! 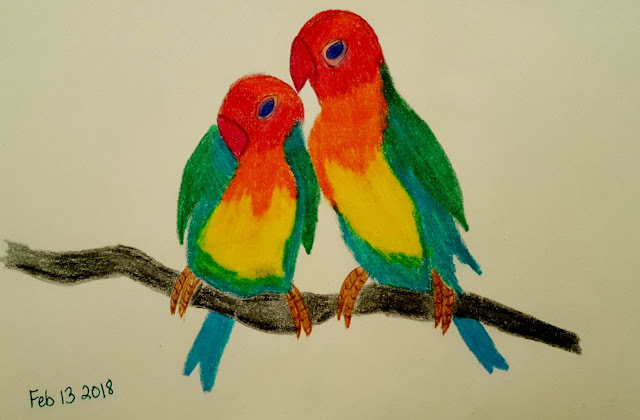 your art is very appealing my friend ,you are wonderful painter as these birds in last are so lovely and perfect for the day of love! This is such a fun post!! I love how you decorated the fridge! I cut out a red heart and put it on the skeleton in my office. :) I hope you are not getting rain. We are back to frigid cold temps again. I am just so very sick of this weather. I can't wait to hear how the fondue went! 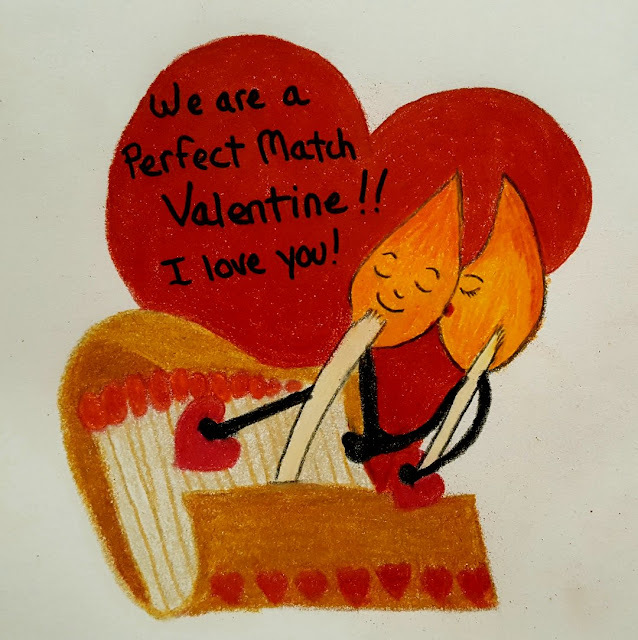 I like your sweet mushy card you made. Looks good! Your comment on my blog entry... Here.... I like that! The Dark Moon! Because the New Moon doesn't "say" to me, how "dark" it is, Feb. 15. You always help me, with such. Thank you!!! I like the blue heart, looks like someone made it in the sand, and the wind is blowing it away. I hope you had a great Valentine's Day! I love your drawings and your special dinner! The fridge is too cute! You made my heart smile! Your poor puppies!!! Give them hugs from me! Big Hugs! Mushy love is good, it's so easy to forget to take time to express such in art and action. Good on you! Glad the pups are healing. Had to laugh at the "licking in secret" comment! Hi Kristina :) Sorry to hear you lost your zip. I hope everything starts to get a little more balanced in your household! Hi Serena :) Thanks :) I like my watercolours the most, that's for sure! :) Oh, your poor pup! Well, I keep "catching" Pavlov licking his toes...I just have to say his name loudly and then "NO" and he gives me a fearful look, poor thing...but it keeps him from licking. The vet tech gave me a tip. She said take some Vicks Vaporub and dot a little bit around the areas where they lick and they "should" get turned off by the smell and leave it alone. I'm going to try it if he still goes after the toes! Thanks Debra! Have you got your fondue pot out yet??? LOL RO :) Mini Martha lol...I have Mini Me in mind now eeek! Thanks Dianna :) I want to see a photo of you skeleton with the heart!!! 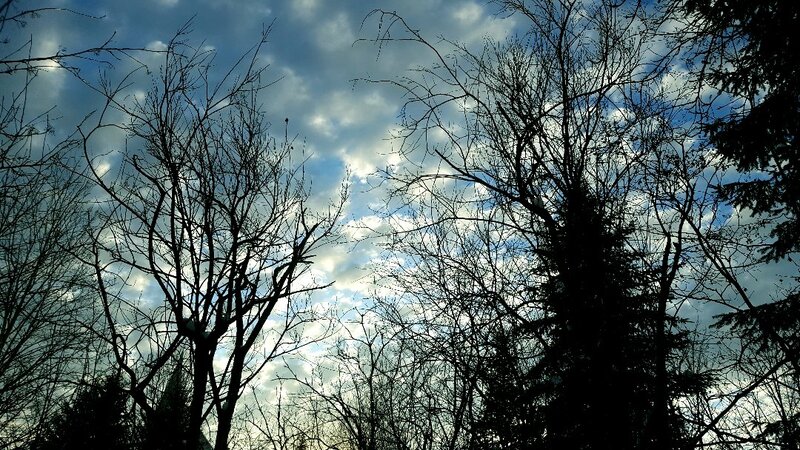 We did get rain, freezing rain, now it's sunny and mild but tomorrow it's back down to the minus teens. Icky weather. I said to Alex yesterday that I really wish we could live in a milder climate...but I want to stay in Canada so I have to accept that I'm just going to ache for 4 months out of the year. sigh. Hi Magic Love Crow :) Big hugs right back to you and yes, the dogs will get even more hugs on your behalf :) Dinner was awesome! We still have that cake, half of it, three days later...it's rich, I'll blog about that on Sunday! I am loving your drawings...I need to check what this coming week is in Scribble Picnic, I have missed out on the last two. Great job. Your drawings are so inspiring, Rain! I’m going to do my best to make time to draw as such today too. Really struggling to doodle every day and disappointed in myself there but as it is, there are other stresses with my work that leaves me totally depleted of creativity at the end of the day. It is enough to keep up with our picnics...and look at me now— 4 days later finally visiting everyone! Your mushy theme is simply gorgeous— full of feeling. Brilliant job, Rain, truly! Thank you so much. 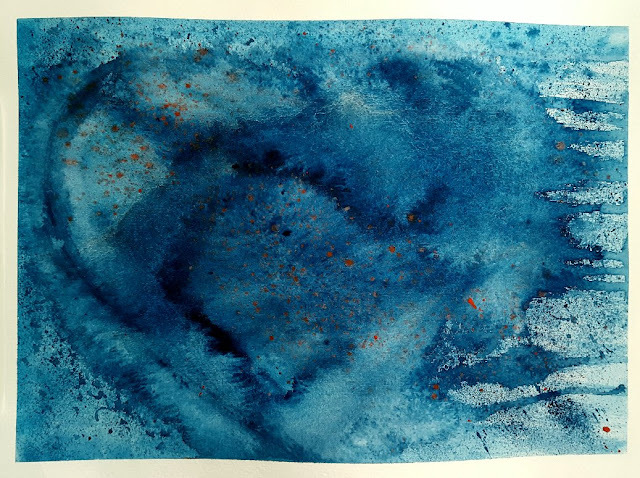 I love the very first watercolor! And I love how intensely romantic you are. :) I know Alex does too! What cute drawings for "Valentine's Day"....all that love! Your watercolor is beautiful and the old ones are so corny and cute. Happy belated Valentine's Day to you and Alex! The sweetest couple I know! Love the card you made for him too. Loving the weather lore...I have never heard of that saying but it's a good one! I really liked "monster love"! 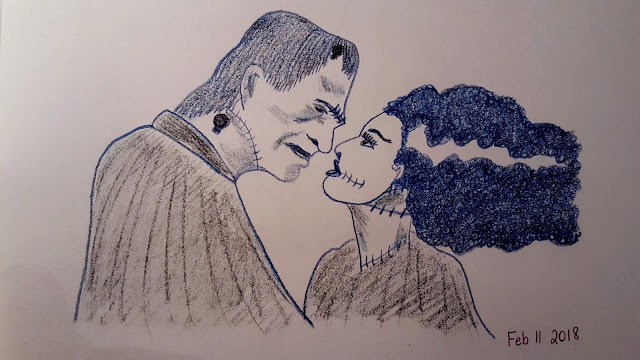 I like that Monster Love. Poor doggy and bad doggy although he was a sly fox on figuring out how to lick his toe, LOL. Glad you had a great Valentine's Day. One child decided last minute to participate so I had to go to Target and scrounge through what was barely left. I picked up a pack of individually wrappy M&M's which was supposed to have 30 but it was short two. I complained on the company's website. I'm supposed to get a complimentary coupon. The teenager made a batch of chocolate chip cookies which were a hit. Oh Stefanie...it works! When you complain to the companies they usually act and send you free stuff...good job. I wouldn't have let 2 M&M's go either! :) I think the Monster Love is my fave too! :) Pavlov...little bugger...lol!